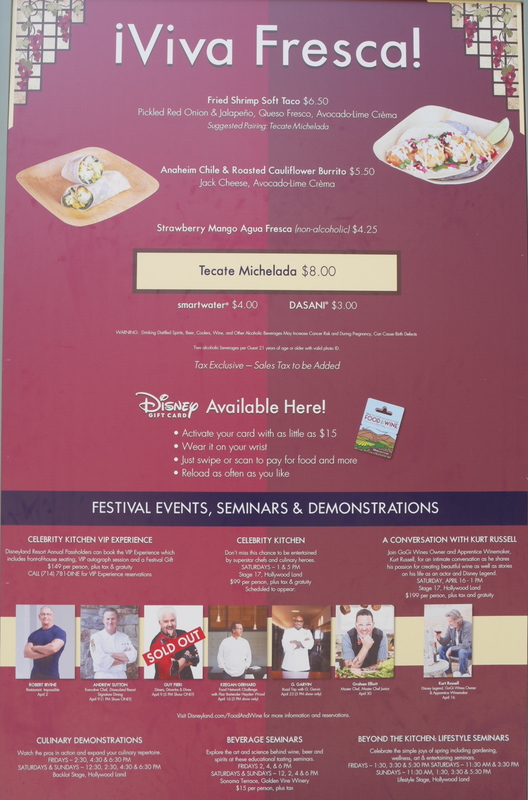 Upon arriving to the festival, I learned that there was a tasting passport annual passholders could purchase so I took advantage of that deal. 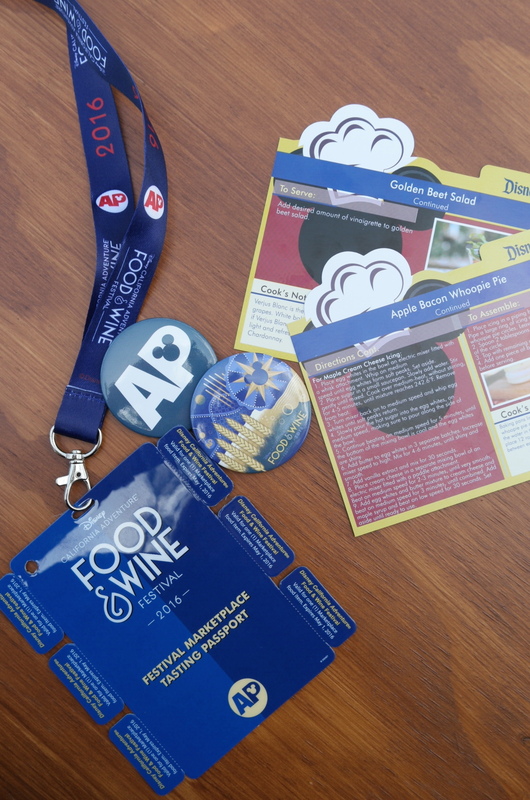 For $39 you received a lanyard with the tasting passport that had 6 tasting coupons attached to be used at any marketplace of your choosing, plus a button to commemorate the Food & Wine Festival, a couple of recipe cards from the various marketplaces, and access to the Blue Sky Cellar if you wanted to take a break and cool off indoors. My first stop was at Gold Rush Marketplace. I had seen the Triple Cheese Mac on Instagram and couldn’t wait to try it for myself. I was so excited to get started on my samplings. 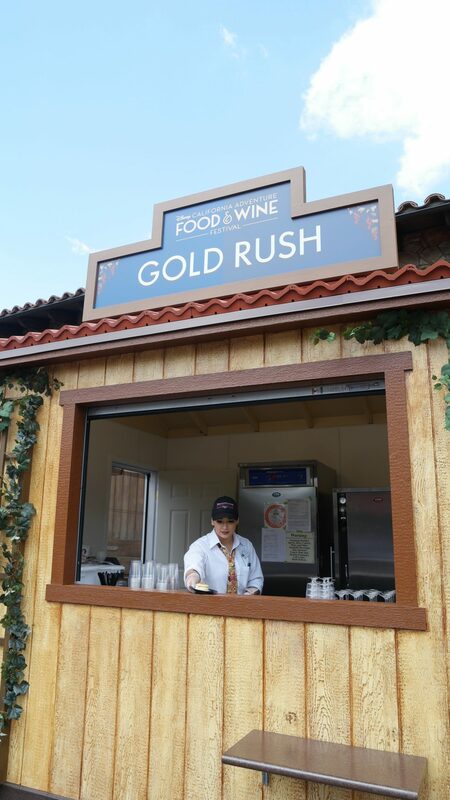 that I forgot to snap a pic of the menu, but Gold Rush had Artichoke Chips and an Apple Bacon Whoopie Pie, in addition to the Triple Cheese Mac. 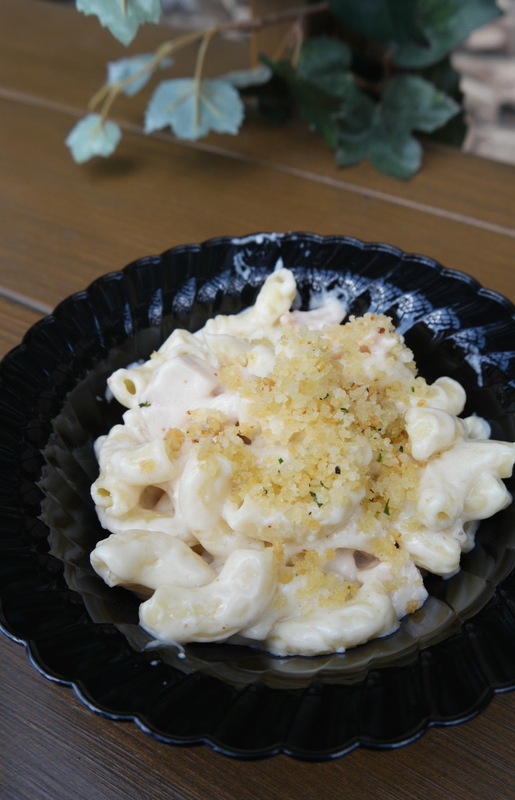 The mac was so creamy and the chicken had a subtle smokey flavor. It was a delicious blend of cheeses and I loved the breadcrumb topping. My dad took one bite and decided he needs to replicate this mac n cheese. I hope he does! The whoopie pie from Gold Rush was fun and tasty! 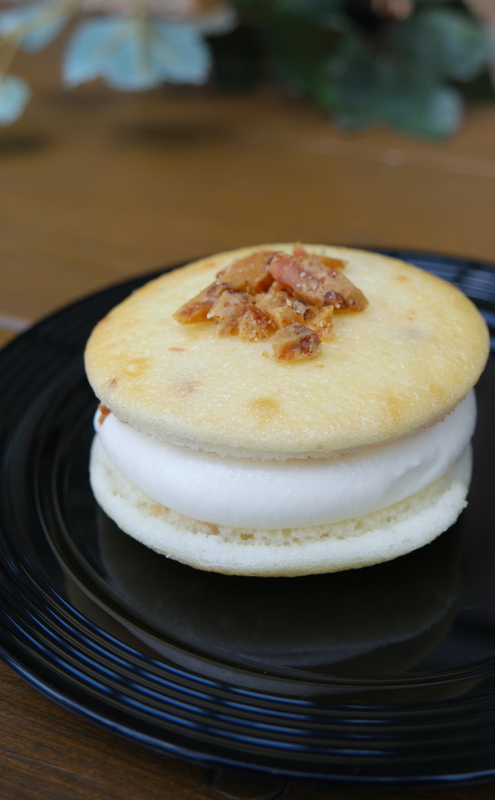 The bacon on top was candied and almost like a brittle. The frosting was very smooth and creamy and the apples were a nice texture change in the center. 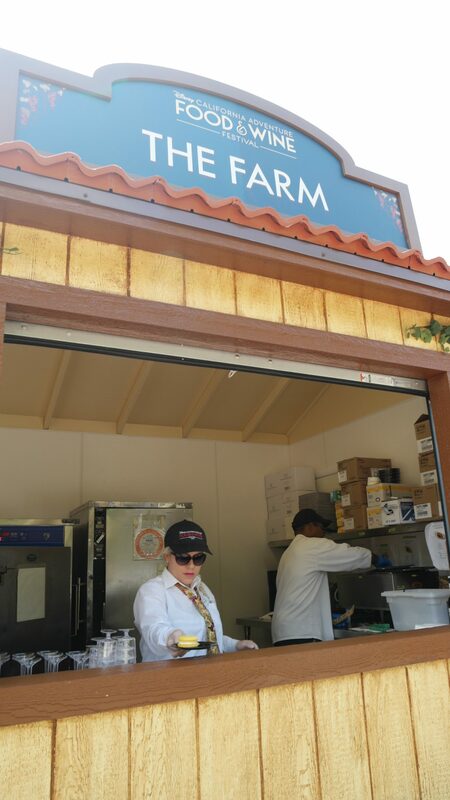 My next stop was The Farm Marketplace. I was anxious to try their grilled tenderloin slider and Meyer Lemon Macaron. 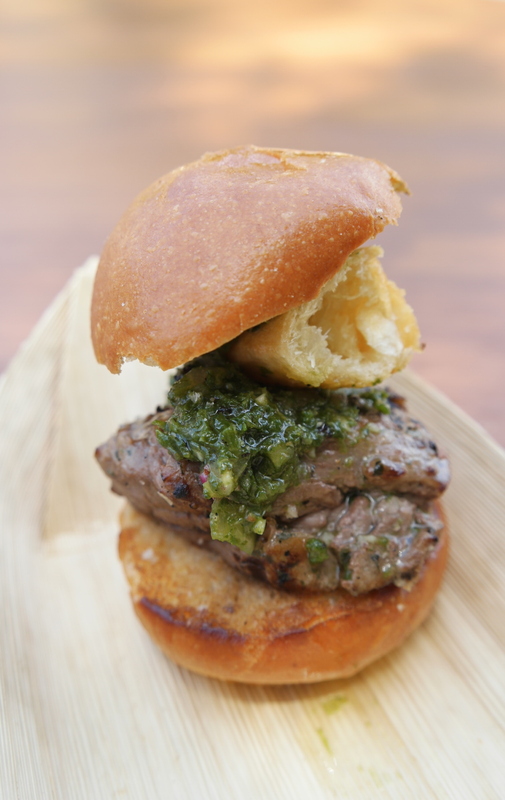 There is something special about steak and chimichurri together so I knew those two on a slider would be right up my alley. Not only was it the prettiest little slider, the flavor was outrageous. Although, the meat was slightly chewy. I prefer my red meat a little pinkish, but nonetheless it really great especially with the fresh flavors of the chimichurri sauce. OH EM GEE! The delicate Meyer Lemon macaron from The Farm was filled with a Meyer Lemon frosting and a dollop of blueberry coulis in the center. Meyer Lemon is always a winner with me and blueberries pair so well with lemon, so it was perfection. 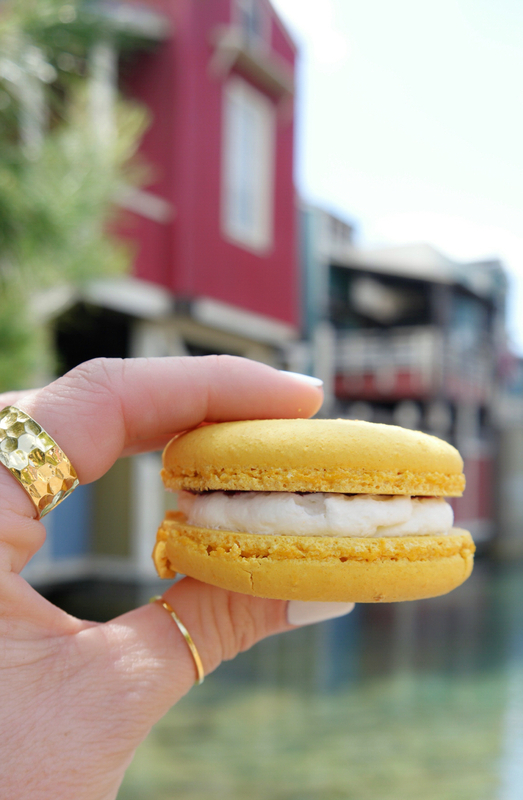 I was so tempted to order a second macaron after I devoured this mac. 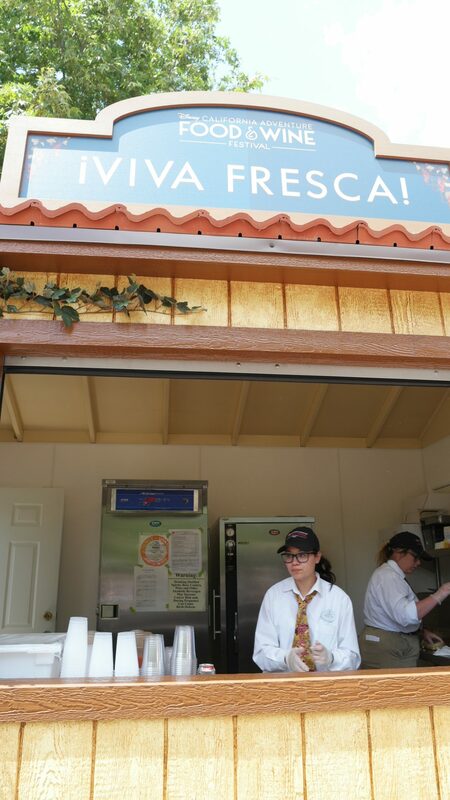 The next stop on my culinary tour was Viva Fresca!, for a Fried Shrimp Soft Taco. Living in Southern California, San Diego to be exact, we have quick access to a lot of seafood tacos with having so many taco shops around. And it is one of my very favorite food items so I have definitely consumed many in my life. With that being said, I have to say, the fried shrimp taco from Viva Fresca! may be one of the best tacos I’ve ever had. Looking back at my pic has me feeling so many emotions, I want more and more of these tacos. 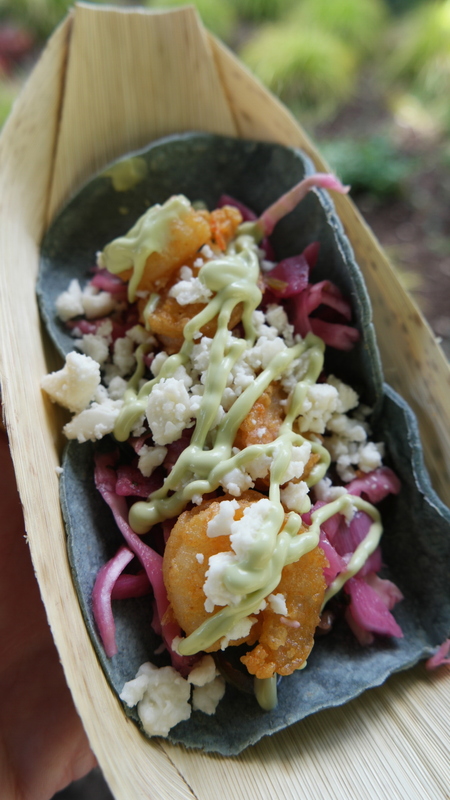 With the tasting, you received two blue corn tortillas topped with perfectly fried shrimp, queso fresco, pickled onions & jalapeños, and an Avocado-Lime crema. Yes, yes, yes!!! After my taste buds were blown away by Viva Fresca!’s taco, I headed to LAstyle. What is better then topping off a great taco, with another taco?! 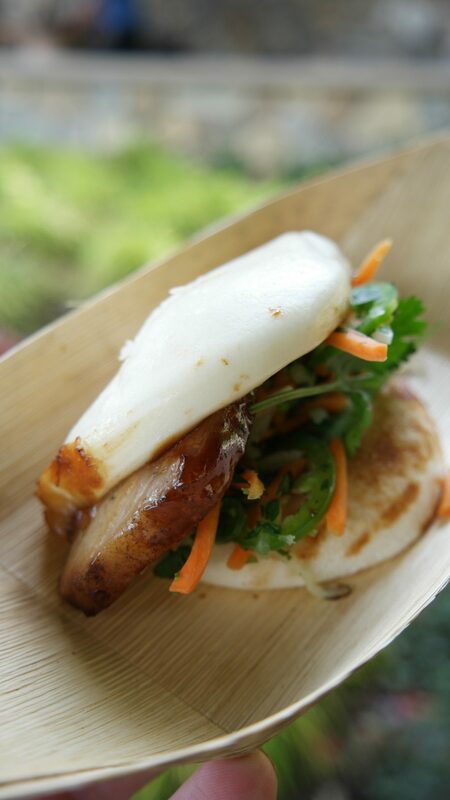 At LAstyle I ordered the Pork Belly Bao Taco. You can’t go wrong with pork belly! The pork belly melted in my mouth, the bun had a perfect chew to it and the fresh vegetables and herbs tied it altogether. Two thumbs up! LAstyle also offered this Milk Chocolate Caramel Tart. 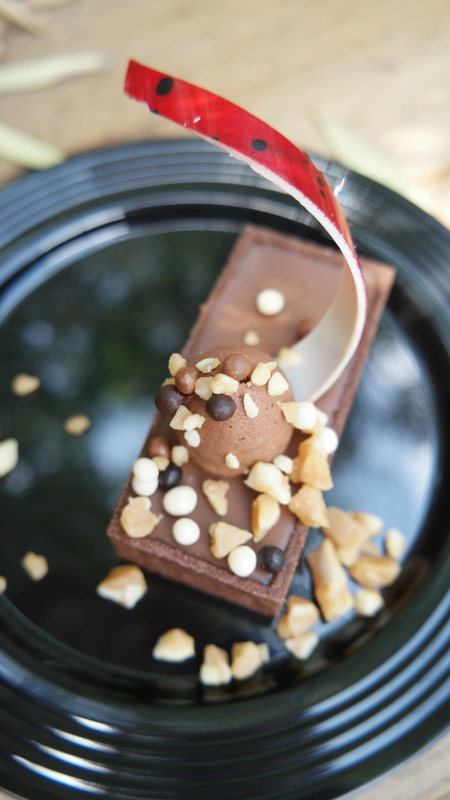 The tart had a chocolate crust, topped with a dollop of chocolate frosting, chocolate pearls and almond brittle. I loved it! I am normally a dark chocolate girl especially paired with caramel, but the milk chocolate worked really well and still added a rich chocolate flavor. 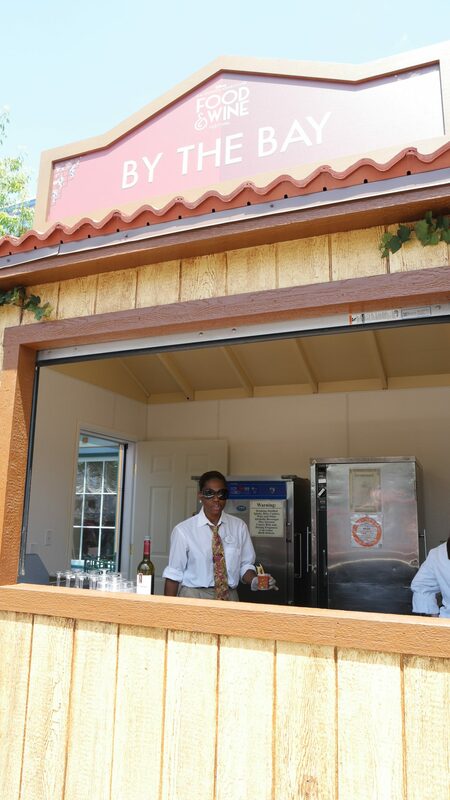 My last stop was at By The Bay Marketplace. My 13 year old joined me on this tour because he loves soup in a bread bowl, especially when we are at DCA. 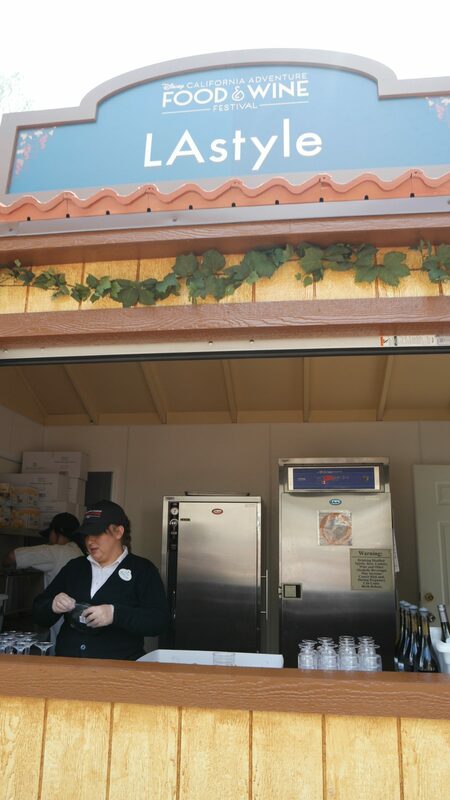 It seems to be his go to for lunch or dinner from Pacific Wharf Cafe while at the park. My son for sure wanted the bread bowl. 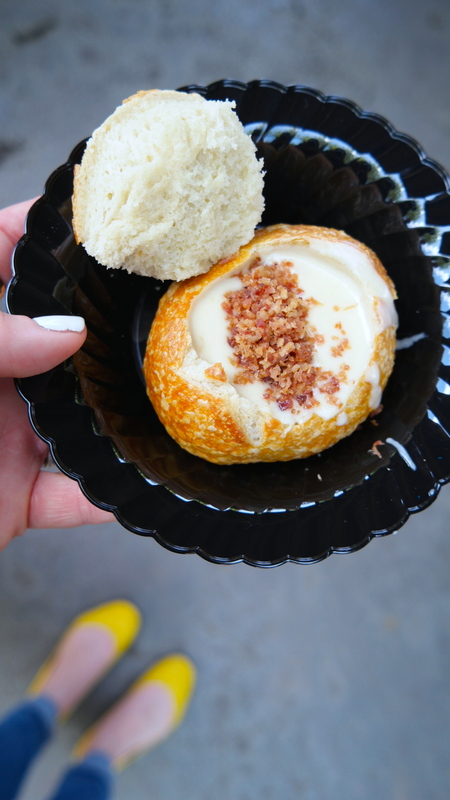 He loves Boudin Bakery, cheese, bacon and bread bowls so there was no question he would order this tasting from By The Bay. Mini foods are always the cutest! So how adorable is the mini sourdough bread bowl. I was only able to grab this quick pic, take the tiniest bite before it was ripped from my hands and devoured by my teenage son. It was so good! The soup did not have an overwhelming ale taste, which I was happy about. The sourdough was soft, yet had the chew you expect from sourdough bread. 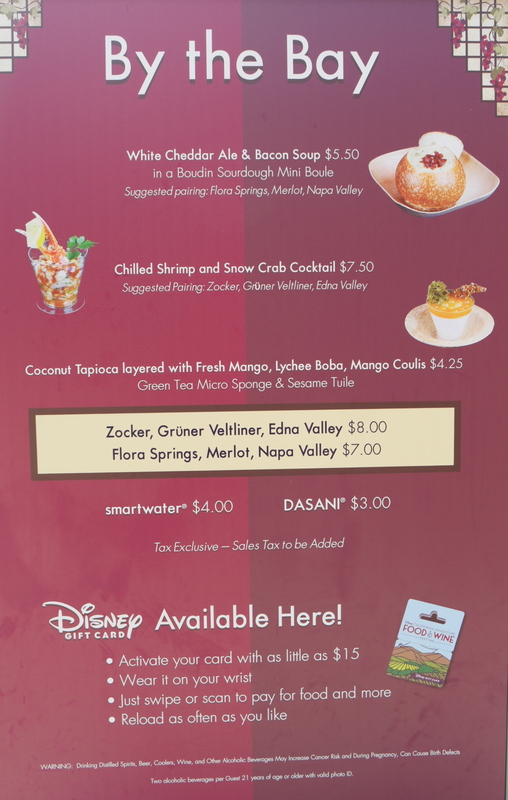 My son votes this soup be added to Pacific Wharf Cafe menu and I would agree. 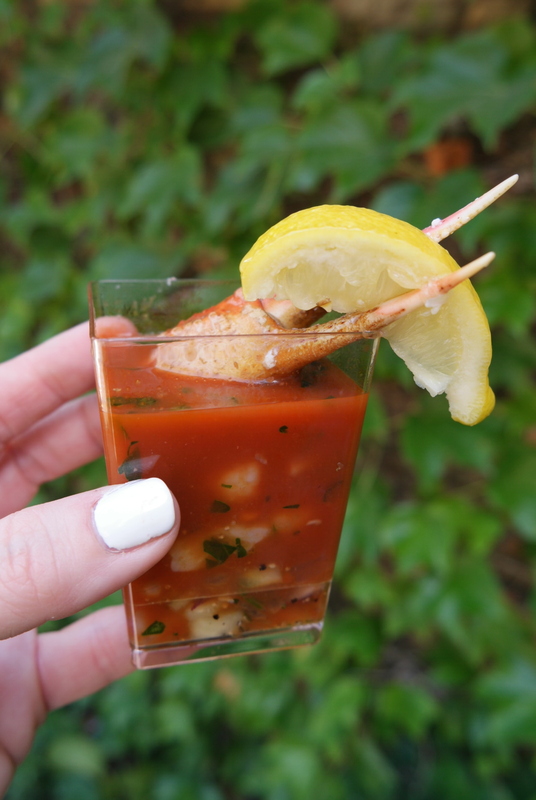 My final tasting at the Food & Wine Festival was this Chilled Shrimp & Snow Crab Cocktail. First I removed the meat from the crab claw, gave it a squeeze of lemon and enjoyed. Wowzers, so much shrimp and crab was packed into this little cup! 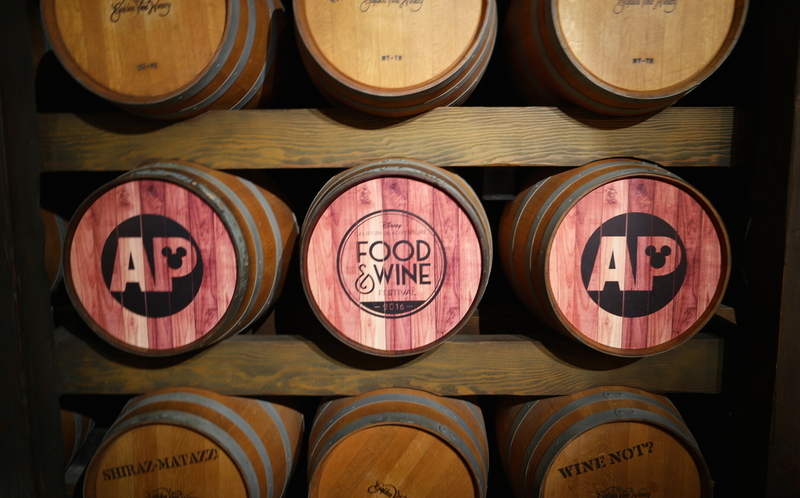 It was the perfect end to an afternoon of sampling California flavors. Sadly, I did not make it to one of the marketplace, Wine Country. I don’t know what happened and how I skipped it?! I’m kicking myself! At least I got to enjoy most of the tastings. 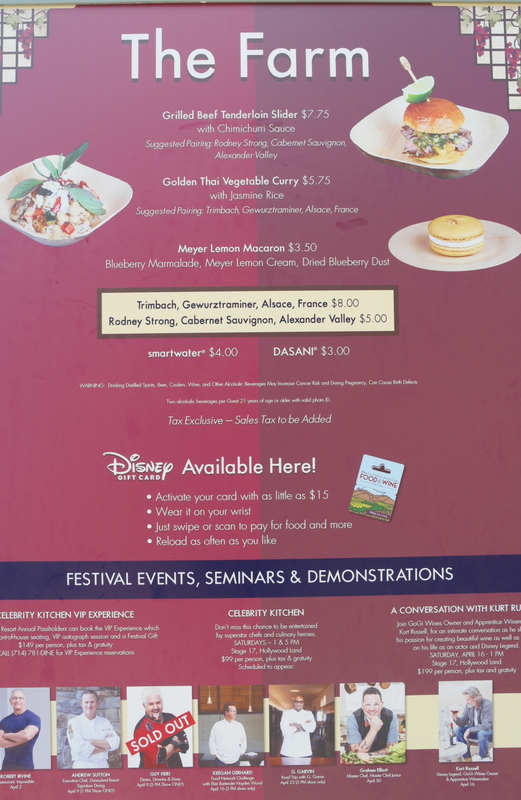 I skipped the wine part of the Food & Wine Festival, but I did see some good wines on the menu. I also skipped The Brewhouse. They had beer flights, that seemed to be very popular. 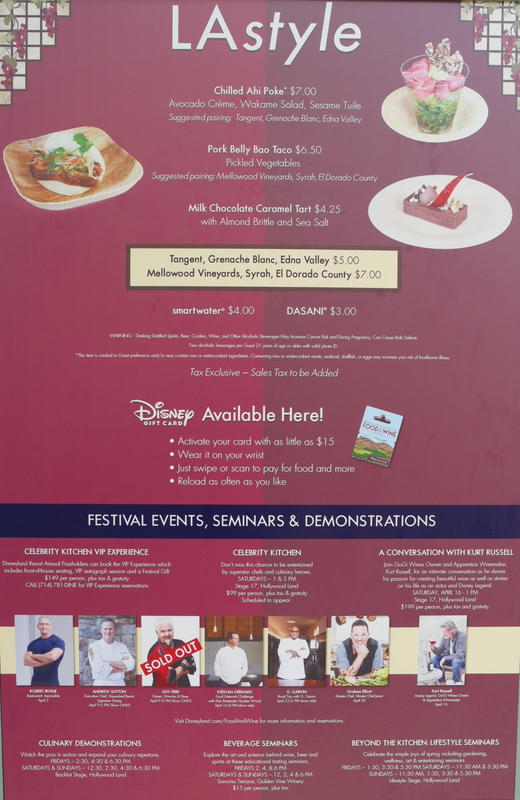 I am already looking forward to next year’s Food & Wine Festival. 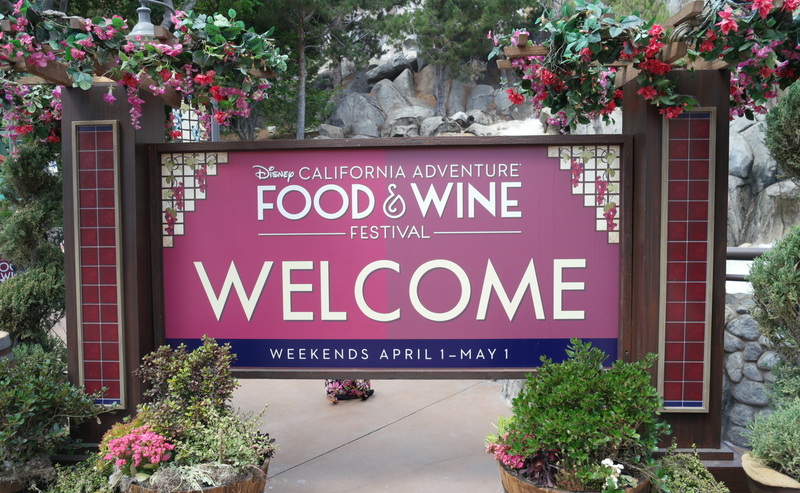 This year’s festival left me full, satisfied and with a greater appreciation for California’s offerings. 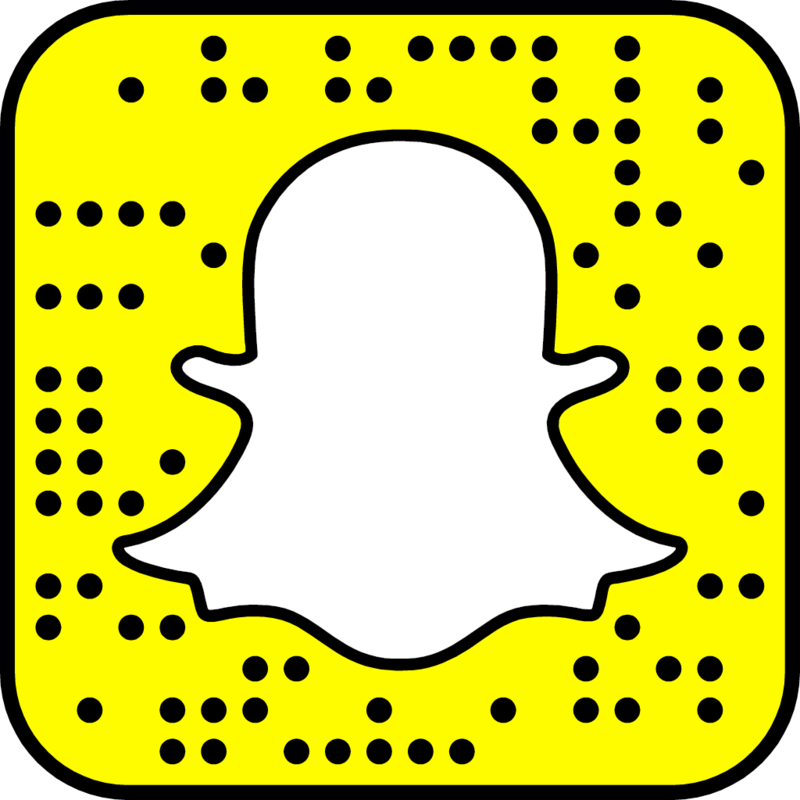 I have just started following you since Amber (she’s my neighbor) shared a post from your Vegas trip. I love food as much as you do and I love all your pictures and reviews! I was just at Disneyland on Wed. and wanted to get that macoroon but skipped it:( Look forward to seeing your future posts! !